After high-school graduation in 1957, Jean spent a memorable year with her family in Tehran, Iran. She also lived on a kibbutz in Israel as part of the International Farm Youth Exchange (IFYE) Program. Both experiences fostered her respect and love for people from other cultures and religions. She and longtime Alaskan Pierre Sundborg fell in love on their first date in May 1966 and were married in December. Pierre’s 30-year career with IBM brought the family to Seattle in 1968, then to New York, Texas, Leicester in England and St-Paul-de-Vence in France. They adopted infants George Charles (named for both grandfathers and a great-uncle) in 1969 and Lynn Marie (named for Jean’s mother “Lynn” and Pierre’s mother Mary) in 1971. Lynn died in 2007. Wherever she lived, Jean was an active volunteer and community member. After moving from Normandy Park to Seattle in 1992, Jean co-founded and led the Uptown Alliance. She reminded all that it’s not “Lower Queen Anne”; northward progression has historically been Downtown, Belltown, Uptown, then Queen Anne atop the hill. She happily counted 34 businesses and residences named “Uptown”. Jean was the driving force behind the creation of Uptown’s Counterbalance Park. Mother’s Day usually found her protesting nuclear weapons at the Ground Zero Center for Nonviolent Action. In the 1990s she worked for Triangle Associates, specializing in waste reduction and recycling. Always close to her heart was her beloved Unitarian-Universalist church where she led in many positions. In retirement, she pursued passions of traveling and family genealogical research, the reason for full names and dates here. 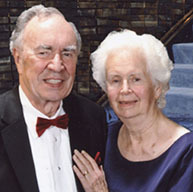 The photo above left is Jean with Pierre on a 2009 Holland-America cruise. The photo above right was her last Sunday, during a Baltic cruise aboard the Rotterdam; we are grayer, same dress and tie, no longer needing glasses, heads fuller of joyous experiences! While choosing to go dancing that Thursday, she felt a headache, a sign of massive cerebral hemorrhage. Unconscious in minutes, Jean died the next day, June 22, 2018, tended by Pierre and caring nurses in the North Estonia Regional Hospital. She is survived by Pierre, son George in Puyallup, brother Larry in Sandpoint, Idaho, sister Nancy Penrose and husband David Muerdter in Seattle, nieces Liisa and Claire and nephew Geoff, Sundborg sisters- and brothers-in-law, and their families.